The Brandeis Library invites you to join us in celebrating this creative, intriguing, and delicious event. An international festival in commemoration of the birthday of gastronome and author Jean-Anthelme Brillat-Savarin, it takes place annually on or around April 1. 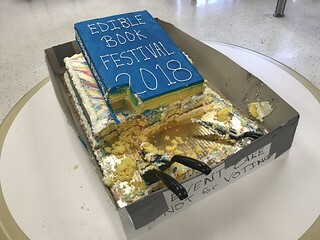 Members of the Brandeis community are invited to submit edible creations inspired by books, which are displayed, judged, and finally consumed in an all day event at the library. Whether or not you submit an entry, please swing by in the morning and vote for the Best in Show to help us distribute one of the four awards given. After our judges have deliberated on which of the entries exhibits the Best Visual Presentation, made the Most Creative Use of Ingredients, or deserves Funniest/Punniest, see the awards bestowed and discover if you voted for the same piece as everyone else for Best in Show. Finally, help us eat our words and consume the entries in the afternoon! Keep an eye out for flyers, posters, social media, and on the BrandeisEVENTS Calendar for this year’s date and the day’s timing.